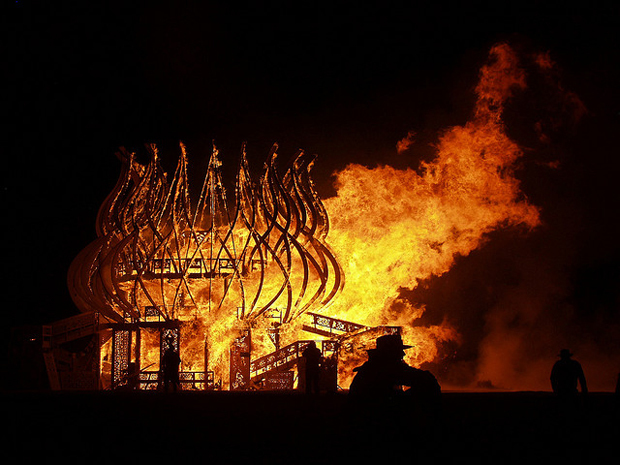 Burning Man veterans–including top VCs, entrepreneurs, and the founders of Google–have an extra reason to celebrate today. Not only is it less than a month until they go to the Nevada desert again, but the Burner community just got a Silicon Valley giant to back down. Burning Man veterans–including top VCs, entrepreneurs, and the founders of Google–have an extra reason to celebrate today. Not only is it less than a month until they get to go camp in the Nevada desert again, but the Burner community just got a Silicon Valley giant to back down. The saga started three weeks ago, when the Flux Foundation, a new nonprofit founded by the artists building the festival’s largest structure, got word from PayPal that it needed to better document its nonprofit status. Temple Manager and Project Administrator Catie Magee said she filed the required federal and state paperwork on April 17th, opened a bank account shortly afterward, and a PayPal account on May 1. Receiving online donations was crucial for the 300-person artist group and their efforts to construct the Temple of Flux. At $180,000, the Temple of Flux will be a series of massive dunes, peaks, canyons and other natural landscape features–the largest temple in Burning Man’s 25-year history–and the stage for some spectacular fireworks. The Flux Foundation, which scored a grant from Burning Man LLC to cover one-third of the structure’s cost, raised funds through events and direct solicitations. The San Francisco-based group raised more than $80,000 in the span of just over two months–from 25,000 friends on the Burning Man Facebook page, 4,000 fans on the Flux Foundation page, and a devoted following on Twitter. Until PayPal receives final documentation, the foundation cannot accept further donations or withdraw any new funds. Not that it matters. Magee drained the account and is now encouraging supporters to use WePay, which helped the group set up an account free of charge. Good customer relations is good business. After all, Burning Man’s ticket site features PayPal as the first payment option for its $300 tickets–and the Burning Man organization itself is a roughly $10 million-a-year business. It pays PayPal not to upset Burners (including many of its own employees).